Truck drivers using the Uber Freight load-booking app can now rate shippers’ and receivers’ facilities and share feedback on factors such as wait times and amenities. 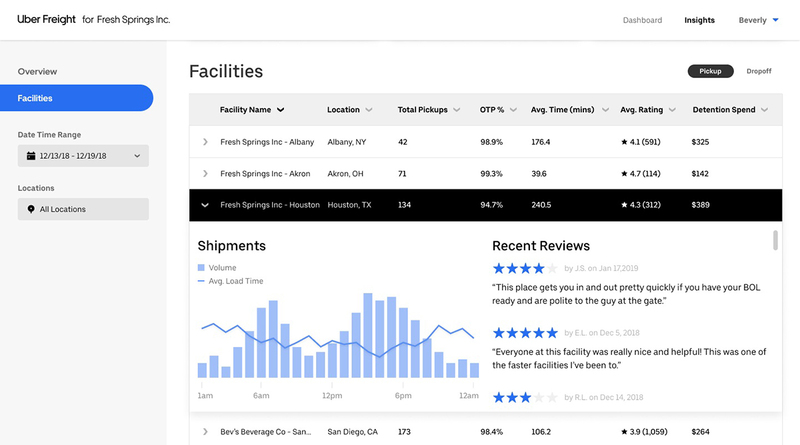 Uber Freight said this new facility ratings feature is designed to help carriers make more informed decisions about which loads to accept while giving shippers greater insight on how they can improve driver satisfaction at their locations. “What’s really powerful here is they’re sharing the information with the people who can make the change — who can actually make the experience better,” said Xinfeng Le, carrier product lead at Uber Freight. The feature also displays information about amenities available at a given location, such as access to truck parking, bathrooms and on-site scales. After completing a load, carriers receive a prompt within the app to rate the facility and have up to seven days to provide feedback. Carriers and their drivers can rate facilities on a scale of one to five stars, much like the ratings system in Uber’s ride-hailing app for car passengers. They also have the option of posting a written review. The facility ratings are visible to all drivers, who can consider this information as they are deciding which load to take next. The same ratings and reviews also are available to shippers within Uber Freight’s shipper platform. As shippers contend with tight freight capacity, it is increasingly important for them to attract and retain the right carriers to move their shipments, said Kate Kaufman, director of account operations at Uber Freight. While shippers can’t control broader freight market conditions, they can take action to make their freight more appealing to carriers. “The levers that you have within your control are your facilities, and offering things like expedited in and out times, lower detention and quicker turn rates for drivers, or amenities that make drivers comfortable while they do wait to get a live load,” Kaufman said. Some shippers are already looking at ways to utilize the carrier feedback. “The data that Uber Freight is providing with facility ratings in their platform is a great validator for making improvements to our operations, whether that means reorganizing personnel shifts or even moving to a bigger facility,” Robert Fisher, procurement manager at Nestlé, said in a statement. Uber Freight rolled out the facility ratings feature to all carriers using the app Jan. 31. The ratings also will become available on the shipper platform in the coming weeks. The technology company said it already has accumulated ratings for more than 10,000 facilities during a two-month pilot of the feature.